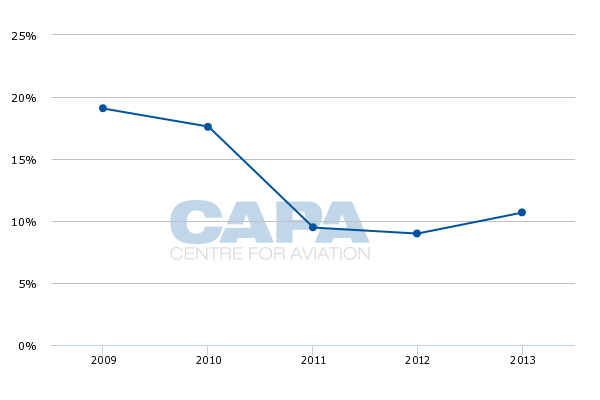 China's aviation market is slowing. In aviation, China's double-digit growth days may be gone, but Boeing is buoyed by recent developments and has raised its 2013 projection for new aircraft by 7.8%. Underpinning the growth outlook are policy reforms that have ushered in new airlines, including low-cost carriers, which historically grow fast. They also grow traffic. No less than 19 airlines in China have recently launched or plan to. In its growth trajectory, China is expected to receive 301 new aircraft every year for 20 years, or an average of one every 29 hours. In 2013, the main three airline groups – Air China, China Eastern and China Southern – collectively took about 200 aircraft. They expect finally to moderate growth in 2015, when a new five-year plan starts across the country. Start-ups will quickly grow from small bases and Beijing must progressively find a balance between their ambitions and the protectionism sought by incumbents. At a time when China is reputedly slowing growth, Boeing in Sep-2014 raised its forecast for the market. (Airbus provides a general Asia-Pacific and not China-specific forecast.) In 2013 Boeing projected China would need 5,580 aircraft over the next 20 years, a 6% increase in growth compared to its 2012 forecast. In 2014, this was bumped up to 7.8% growth, or 6,020 new aircraft. That equates to one new aircraft every 29 hours for the next 20 years. 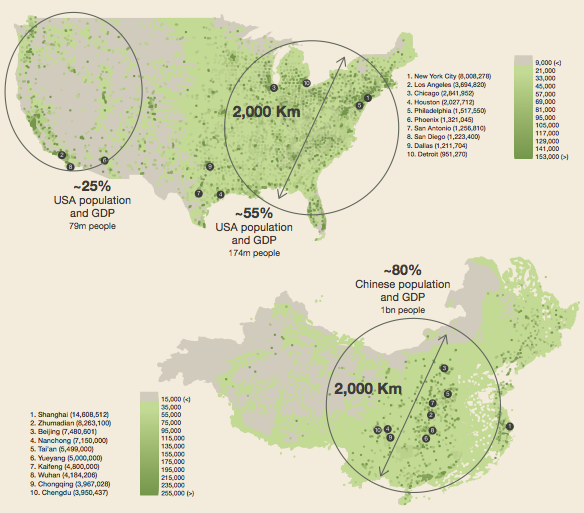 While the story about China is growth, there is also significant replacement occurring. Net of replacements and retirements, China is forecast to end 2033 with 6,930 aircraft, 7.4% more than the 6,450 Boeing expected China would have at the end of 2032. 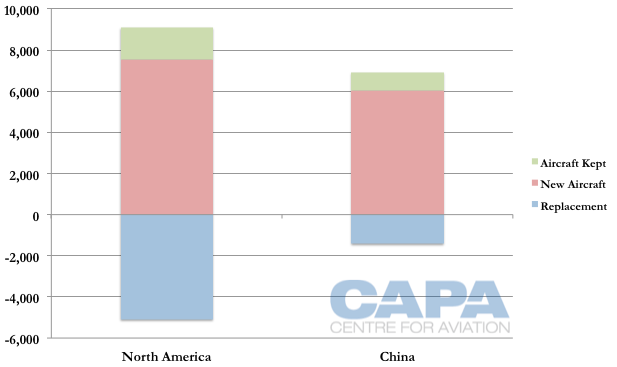 North America is predicted to take an even larger number of new aircraft (7,550, in pink on the graph below) but there will also be more replacements (in blue). North America in 2033 is predicted to still have a larger fleet than only China. However, North America's 2033 fleet size (pink and green combined) will be only 32% bigger whereas in 2013 it was 188% bigger. There is naturally some elasticity in how aircraft figures translate to growth, which has tapered from 20% in 2008 to around 10% in recent years and is forecast to slow further but from a larger base than before. Reform of air traffic and permitting red-eye domestic flights would bring greater efficiency and traffic growth, which could be achieved by more aircraft operating in the new environment or fewer aircraft operating longer hours to achieve the previous forecast. The pace of visa liberalisation in foreign markets could also change the growth rate, as was seen with Thailand temporarily waiving visa fees for visitors from greater China. Since 2009, China's main state-owned airline groups – Air China, China Eastern and China Southern – have collectively grown annual new aircraft additions (exclusive of retirements) from 100 to 200. They would like to slow this pace, where this growth in aircraft numbers results in over-capacity, declining yields and reduced load factors. The growth the airlines have pumped out is exhausting work and precluded many strategic changes and innovations. These will be necessary in their core domestic market as liberalisation gradually occurs. Becoming more agile and smart is also necessary in international markets, which are smaller than domestic ones, but with higher profiles and larger impact on finances when things go amiss. Despite over-capacity being apparent, airlines have not found their regulator willing to decelerate the growth of deliveries until 2015, the start of a new five-year plan. This delay in recalibration has greatly frustrated China's incumbent airlines. China Southern (company, not group) took 70 aircraft in 2013, but expects to take 42 in 2014, under 40 in 2015 and under 35 in 2016 – halving its aircraft growth in three years. The big three have already slowed domestic growth. Slowing growth at the legacy airlines is offset by the nearly two dozen start-up airlines as well as existing lower-profile airlines. In 2014, six Chinese airlines had a fleet of over 100 aircraft. By the end of the decade, there could be 13 Chinese airlines with a fleet over 100. The major caveat is that there are projections and then what Beijing will permit. Aircraft imports are closely monitored. China is embarking on some liberalisation, but as far as aircraft inductions are concerned, Beijing said it would only "try" to limit its influence. Growth will be a contentious and much-fought balance Beijing must find: start-up airlines receiving approval must also be allowed to grow and gain scale, conversely existing airlines will want to limit encroachment, even if their growth is slowing. Perhaps an early positive sign comes from Spring Airlines, the largest airline outside of the Air China/China Eastern/China Southern/Hainan groupings. Spring planned to have 100 aircraft in 2015 but had to delay the target to 2020, but the date has now been brought back to 2018 as reforms cast favour on Spring and other smaller airlines. Growth rates of smaller airlines may be fast, but there will be a gap in the medium term. China Southern Group in 2013 took 88 aircraft, twice the size of today's Spring Airlines. The fleet Spring built up over a decade China Southern added in a single year. But the long-term view is what Boeing has found encouraging. 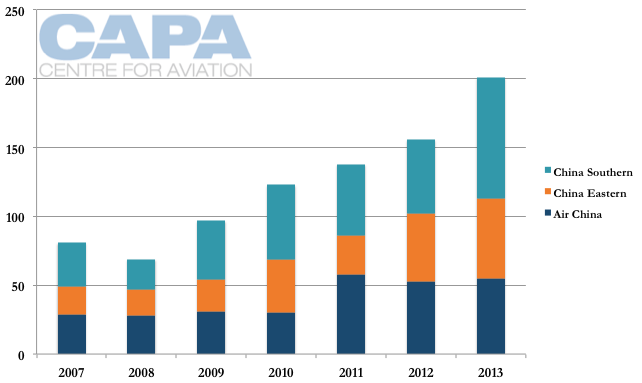 Its overall 2014 forecast is up 7.8% due to 11.2% growth in single-aisle aircraft. It is only single-aisle aircraft that are growing faster than the average in Boeing's forecast, and its Current Market Outlook attributes the growth to policy changes: "The new CMO also shows how the emergence of start-up airlines and low-cost carriers stimulates traffic and allow more people to fly." Not all of China's start-ups have disclosed fleet plans, but those that have are below. 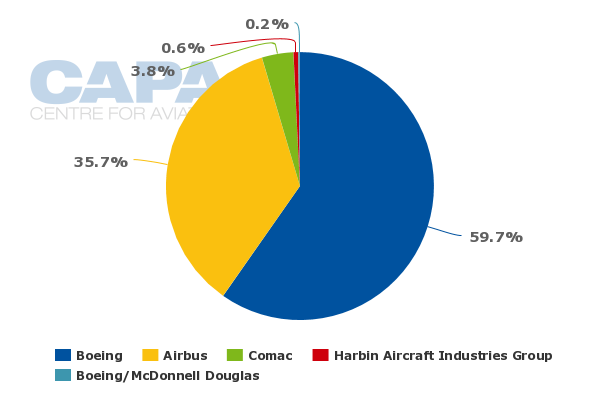 Where Airbus did well in the last round of liberalisation – Spring Airlines and Juneyao operate A320 family fleets – Boeing is, at this early stage, taking the lead. Donghai, Jiu Yuan/9 Air and Ruili have committed to 89 aircraft while others like Fuzhou Airlines will use 737s from their parent company (in Fuzhou's case, Hainan). China United, an existing airline transforming to a LCC, already uses the 737. Airbus has 43 commitments from Loong and Qingdao. But there is still much to play out: a proposed Zhengzhou-based LCC expects to use Airbus aircraft while Airbus-only operators Spring and Juneyao look to accelerate growth. Donghai ordered 25 737-800s and plans to take six or seven aircraft a year until 2020, by which time it aims to have a fleet of 50 serving domestic and international routes. HNA vice chairman Chen Wenli said Guilin Airlines proposes to operate three aircraft initially with plans to expand its fleet to 30 aircraft in three years. Hefei Airlines plans to launch scheduled services with three aircraft. By 2020 the carrier plans to operate a fleet of 30 aircraft, serving 50 to 70 routes, including international services. Hefei reportedly wanted to purchase Airbus narrowbody aircraft to tackle thicker routes, but Joy Air part owner AVIC wanted Hefei to focus on regional routes and use AVIC's aircraft. Initial fleet size is five 737-800s, growing to eight in 2016 and 30 by 2020. Zhejiang Loong Airlines (operating with the abbreviated name Loong Airlines) signed an MoU for 20 A320 family aircraft, including 11 A320ceo and nine A320neo in Sep-2013. Qingdao Airlines in Sep-2013 announced an order for a total of 23 A320 family aircraft, including five A320ceo and 18 A320neo with the first delivery expected in 2016. In Aug-2013 Ruili Airlines and Boeing signed a purchase agreement for 14 Boeing 737 aircraft including eight 737-700s and six 737-800s. The carrier also signed purchase agreement with Air Berlin for two 737-700s in 2013 and two 737-800s in 2014. By 2020, the carrier plans to expand its fleet to 24 aircraft, down from a previously stated 45 aircraft. Waiting FSC (Regional) N/A Q400s The carrier signed a letter of intent (LOI) to acquire 30 Bombardier Q400s which will start operating in 2015. It aims to have 12 aircraft within three to five years. Urumqi operates two 737s in Nov-2014 and is licensed to have up to three 737s in 2014. Okay Airways is a privately owned carrier unaffiliated with others. It is based in Tianjin and follows the regional model, although its fleet of eight MA60s is complemented by 11 larger passenger 737-800s, with additional 737 variants on order. 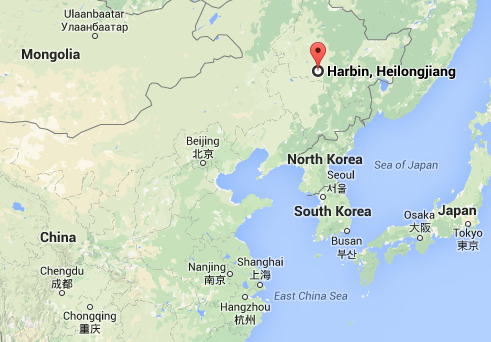 In mid-2012 Okay said it submitted an application to base a regional affiliate at Harbin in Heilongjiang province. Okay has spoken of eventually operating over 100 MA60s. The start-up will operate a fleet of three leased A320 aircraft initially and expanding to six aircraft in its second year of operation. There is an established rhythm at the state-owned airlines to purchase aircraft in relative equal batches from the aircraft manufacturers; the airlines consider this necessary to ensure discounts. A Feb-2014 order from China Eastern for 70 A320s was followed by an order for 80 737s in Jun-2014. Dangling to one manufacturer the prospect of buying five or 10 more aircraft from it rather than from a competitor is a common tactic for achieving a more generous discount. This makes the start-ups more interesting to aircraft manufaturers, as one of them could be the next Spring – or Ryanair/easyJet/Southwest/AirAsia, an LCC with only one fleet type. But China's newer airlines are already diversifying. Spring's Japan affiliate, Spring Airlines Japan, uses 737-800s, a move Spring attributed to greater Boeing infrastructure in Japan but also competition with airframers. Juneyao's LCC subsidiary in Guangzhou, 9 Air, will also use 737s. Also a stated factor in Boeing's revised forecast is Asian lessors, who are increasing in number and fleet size. There is much activity within China as banks look to diversify away from their staple investment of real estate. Leasing has been shown to offer a consistent return, and is an attractive option – and with crowd mentality, becomes more popular as others realise its benefits. Chinese banks in particular sit on large cash piles, meaning they can accept a lower return. Anecdotal evidence from airlines suggests new Asian lessors are offering rates lower than the sector has seen before. 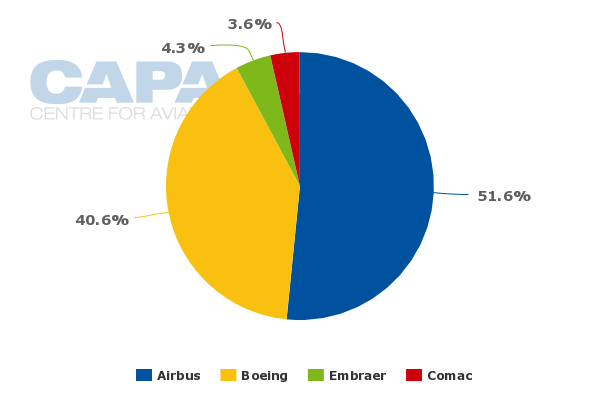 Boeing's revised aircraft forecast includes faster growth in the narrowbody category but also a decline in very large aircraft like the A380 and 747-8. Boeing's 2012 forecast projected 110 such aircraft over 20 years, but this was decreased to 100 in the 2013 forecast and then to 60 in the 2014 forecast. The view is essentially that a Chinese hub other than Beijing cannot support a sizeable very large aircraft fleet. China Southern continues to have difficulties finding markets for its A380s while Air China has ordered a token seven passenger 747-8s. Boeing expects start-ups to focus on thinner routes and new markets, opening new city pairs with small aircraft, replicating the experience in Europe. 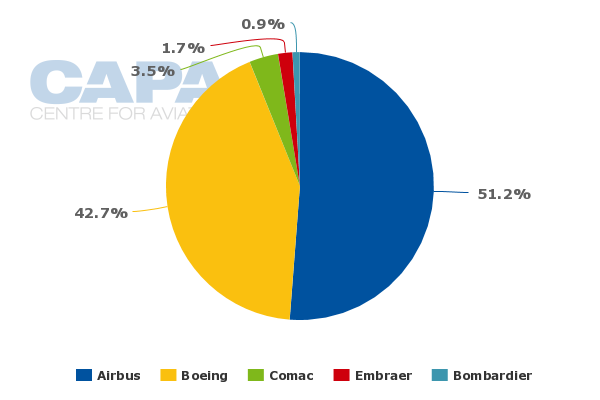 Boeing also reviews the North America market, where widebodies supplied 20% of seats on domestic flights in 1993 but in 2014 account for only 5%. Airbus in comparison is more bullish on domestic widebody use as key airports are constrained with limited growth prospects and China's population is more concentrated than in North America. Airbus is looking to place its short range A330 into China following Chinese airlines use of existing A330 variants on trunk routes. 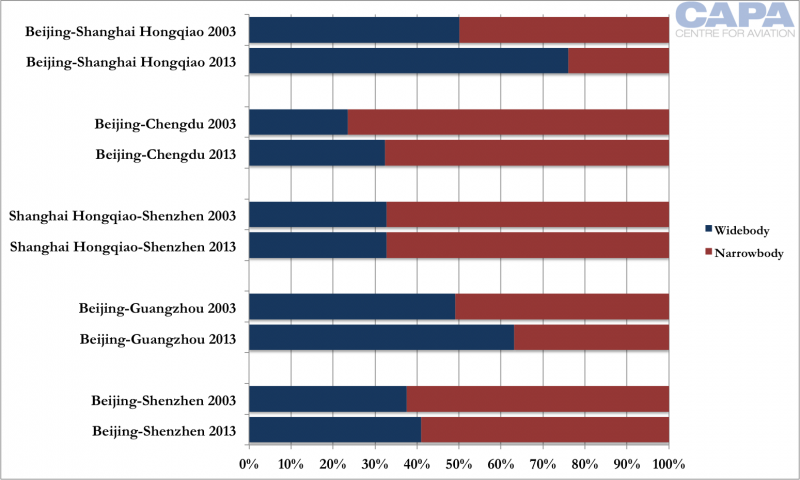 The share of widebodies on Chinese trunk routes has increased; in the case of the heavily travelled Beijing-Shanghai domestic corridor, the shift to use of widebodies is most marked. With high levels of fleet growth also comes retirement. Asia's airlines typically maintain much younger fleets than their counterparts in Europe and the US., and China Aircraft Leasing Group (CALC) has plans for an aircraft dis-assembly operation in Harbin in northern China. A proposed launch of the operation will see an annual dis-assembly of 50-80 aircraft increase to 80-100 and later 100-120. Boeing's China forecast shows about 70 aircraft being retired annually while the sum across greater Asia-Pacific will be larger. Some of those aircraft will go to other operators, but there is a sizeable pool of aircraft for the plant to work with, and horizons could be broader since geography is not a deal-breaker with airlines sending aircraft to other continents for parting out. At a national or local level there may be policies established to support the plant, as occurs in other areas of aviation, but it could also take some time to spool up and maximise the value of extracted parts from the dis-assembled aircraft. It is also necessary to have a robust system to catalogue the parts to sell them in foreign markets if there is to be a market for them. It will also be interesting to watch how the facility plans to accommodate Harbin's long and cold winters, given its northern geography, almost on a parallel with Ulaanbaatar.